Dancing with the Word: Why a Chicken? Thanks for reflecting on the text for next Sunday. It is helpful to read your commentary and to think about Jesus the hen and Herod the fox and how Jesus desired to gather the brood around him to protect them against the wiles of the fox. There is that famous painting of Jesus sitting on the hillside with the dark clouds surrounding him and the moon peering ominously behind him, with the quote from this passage nearby. It radiates the dark feelings that surround Jesus as he thinks about his future. Thank you for these very helpful insights into this text and the choice to use the brooding hen image. Research mother hens on the web. 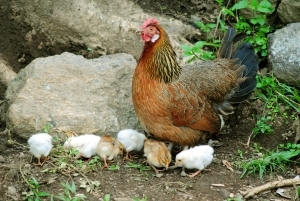 It is facinating to learn why Jesus identifies with the mother hen. A mother hen will alarm her chicks that danger is present. She also puts herself between her chicks and the danger in order to save them. She will even chose to die for them so that they may live. In times of danger she also may draw her chicks to her and hide them under her wing where they remain quite and still during the time of danger. Oh yes... If only we silly little creatures would stand still and stand nearby. The wisdom of the psalm: Be still and know that I am God.